2018 - Starting up on Sun, 29 April - we meet at Pennyfield Lock parking at 9:00 to set shuttle to put in at Violettes Lock. Then we paddled across the Potomac to run down the old George Washington Canal , finishing by paddling under the C&O Canal aquaduct at Pennyfield. This is a class I/II whitewater run for beginners and others. We like to help families down moving water and may work on simple skills like water reading, eddy turns, and paddle group dynamics. 2019 - When we prevail upon the C&O Canal to rewater the Pennyfield to Violettes section, we'll be able to meet at 9:00 AM at Violette's Lock for a trip without need for a shuttle. But not yet. - Tim Tilson & Wayne McDaniel are running this series. Please contact the trip coordinator before heading out for a trip. 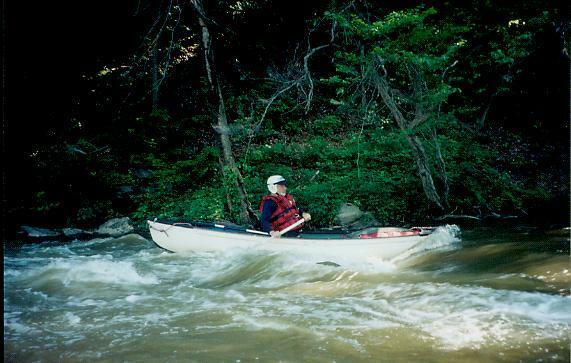 See the American Whitewater River Database for details of this delightful section of the Potomac River.